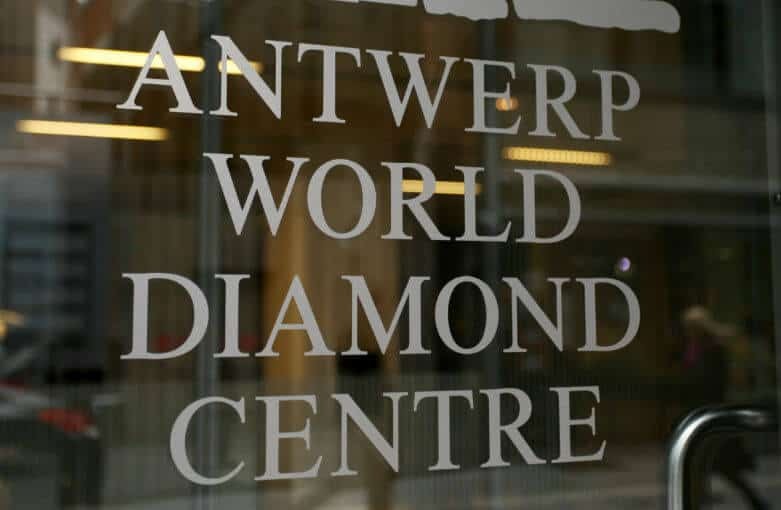 Buying Diamonds in the Antwerp Diamond Center – Beware! The Antwerp diamond exchange is a terrible place to buy diamonds. You would need to navigate a minefield of disreputable and unethical business practices to avoid getting scammed. Even if you manage to avoid all the scams, they aren’t offering good service or good value. Its sad to see a whole industry die out in a city, but it’s sadder still to see those people take it out on consumers. You can read more details below, but the “best” deal we found while shopping the quarter was a 1.01 G VVS2 HRD certified diamond ring for €8,000 plus VAT for a total of €9,680. We are not fans of HRD (that is the understatement of the year). Here is a comparable diamond along with an elegant solitaire setting that will cost you 35% less than the option we found. And that was the best they had to offer. The Antwerp Diamond Quarter (Diamantkwartier) is perhaps the oldest, most storied, diamond district in the world. Long before New York, Hong Kong and Hatton Gardens came on the scenes, Antwerp was cutting and trading diamonds for export and local trade. Antwerp took over as the main European diamond center from Bruges in the 16th century (along with many other import trades). During the 17th century, Amsterdam took over as the leader for a while, but retook the mantel during the 19th century developing relationships with the miners in the newfound diamond trade of South Africa. In the second half of the 20th century, Antwerp’s dominance of the diamond trade started to fall along the rise of Tel Aviv’s position. 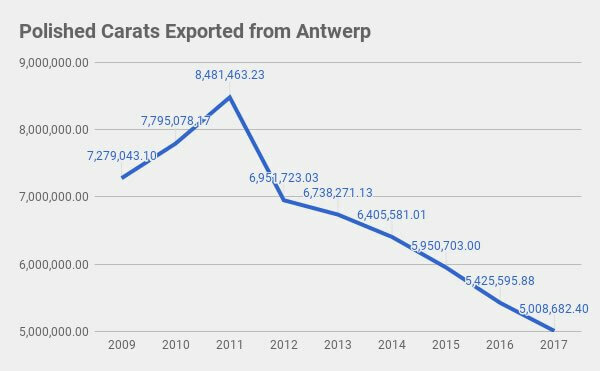 Now, as Mumbai has surged into control, Antwerp’s wholesale polished diamond trade has been in rapid decline (see chart below of amount of polished diamond exports out of Antwerp). Other than rare, unique diamonds (high value fancy colors etc), polished stones don’t even pass through Antwerp due to the very high costs in relation to other markets. Precision cutting, Antwerp’s trademark, doesn’t really come into play anymore with advances in technology (automated laser cutting). As 99% of the diamonds out there are cut in large factories overseas, Antwerp’s expertise is a bygone skill. The modern diamond market has no need for polished “trading centers” that offer no added value. New York is still valuable because it is a major hub in the most important retail market. India is still important because of cheap skilled labor (polishing, sorting, jewelry manufacturing, etc). Dubai offers value in the form of accounting magic, so it, too, has become a major hub (primarily for the Indian manufacturers who are able to take advantage of the accounting tricks). Israel and Antwerp no longer offer any added value in the polished market. Israel has virtually no local retail market. Europe is plunging into oblivion economically and demographically. Neither location has anything special to offer from a labor perspective as well, and both locations suffer from bloated bureaucracies (unlike Dubai). This is why the polished exports of both countries have been plummeting. A world leading diamond manufacturer with which I am intimately familiar has followed this trajectory as well. In every year since 2008, the office in Israel which was previously the central office of the organization has been shrinking while the New York and India offices have been growing. Enhance the attractiveness and credibility of the area to attract diamond stakeholders from around the world to establish in Antwerp. They unfortunately have a long way to go. And if things weren’t bad enough, Tiffany & Co, the iconic bellwether of the jewelry business just announced that they are moving their diamond polishing operations away from Antwerp. The fall of the wholesale polished diamond trade coincides with the fall of value in the retail market in Antwerp. The reality is that the diamonds offered on Hoveniersstraat and Pelikaanstraat come from the exact same place as the diamonds offered online, or in any other retail location in the world: India. That globalization and the ability to purchase from online retailers has thoroughly crushed the retail market in Antwerp. The retailers on those streets are selling diamonds from the same sources (read: same costs) as everywhere else in the world, yet Antwerp is one of the most expensive cities in the world. That translates into higher costs on the retail end (people there need to make more money, overhead is more expensive etc..). This means that Antwerp’s famed diamond district can’t possibly compete with other diamond markets and certainly not with online retailers that can offer diamonds at much lower prices due to their ability to operate on razor thin margins (as we explain in this article). The jewelers in the diamond quarter had two choices; offer an experience (Antwerp is a beautiful city and a nice tourist destination) and superb service. The other option is to use every shady trick in the book to deceive consumers and maintain their margins. Unfortunately, it seems like the jewelers there (at least the 15-20 that I went to) chose the less moral, second option. There were several tricks that the jewelers used, virtually all of which prey on the fact that consumers aren’t educated and they can pull the wool over their eyes. Treated diamonds – This was the most popular scheme they used. I won’t bother comparing them to natural diamonds because its impossible (how can you compare colors when one is treated and has zero resale value). The biggest problem I had with it is that every place we went into either didn’t mention it, or negligently downplayed the downsides of treated diamonds. Non-certified diamonds – This was another common scam they played. In the first shop we went into, the salesperson spent the whole time talking about how to avoid all the scammers on the street. She even talked about some of those dishonest shops would use EGL certification to deceive consumers. Then what did she show us? A 2.01 G SI1 for €11,900. I asked whether the diamond had GIA or HRD certification (they equated the two which is ridiculous) and they said that it was non-certified. She then offered to have it certified for €1,000 by HRD (HRD charges €120 euro for certification and its down the street).The diamond they showed me was a brown diamond and absolutely horrific choice by any measure and wasn’t worth half of what they were charging. They made it seem like it was a great deal (getting a 2ct G SI1 for 12k) when in reality, they were trying to rip us off. Plain old bad prices – I could not find a single place that used GIA certified diamonds that were non-treated (most places tried pushing the fallacy that HRD is as good as GIA). HRD used to be a decent lab (about one grade below GIA), but has recently dropped significantly in quality control. We were shown a 1.01 G VVS2 HRD certified stone in a white gold solitaire setting at the second shop for €8,000 plus VAT for a total of €9,680. The diamond was an H VS1 at best, most likely an I color as well.Even assuming it was an H color (being very generous), the price is obscene. Here is a stunningly cut 1.08 H VVS2 from Blue Nile that is superior in every way (cut, quality and legitimate certification). Adding this beautiful solitaire setting and you end up paying €6,555 including VAT. So you get a better ring and it still costs 35% less. Hiding problems with the diamonds – This was the most maddening experience during my secret shopping. While many places tried to deceive us, the third shop was particularly frustrating. If the family that runs the shop is reading this, you should never assume that someone doesn’t speak your exotic language. The entire time we were there, I had to bite my tongue not to lash out. We didn’t catch the names of the mother and daughter in law, but the worst was when the husband walked in. The mother kept telling me that I should only buy a GIA diamond with a laser inscription because everyone else scams people by selling diamonds that don’t match the certificate (this is not even remotely true, but this was her selling point). Hilarity ensued when she started to show us diamonds. As we are looking at diamonds, I noticed the diamond was horrifically cut. I asked to see the certificate. The daughter-in-law said, in Hebrew, that the diamonds we are looking at don’t have inscriptions. The mother in law then awkwardly said “oh no, the microscope is broken” as she kicked the plug out. Even if I didn’t understand exactly what the two said in Hebrew, it looked like a bad sitcom. To their credit, they didn’t engage in any of the tricks mentioned above (such as treated diamonds, or diamonds with unreliable certification). But their treatment of us left a lot to be desired.